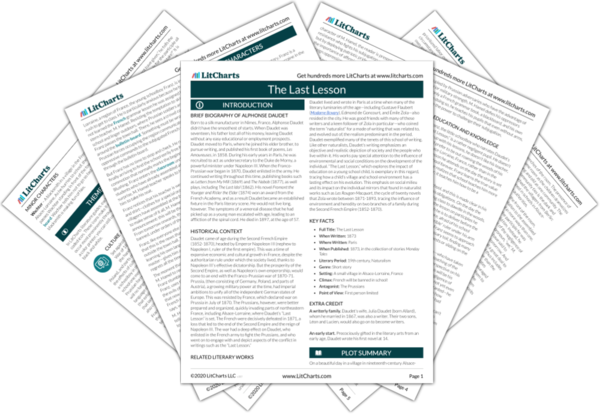 Instant downloads of all 946 LitChart PDFs (including The Last Lesson). Welcome to the LitCharts study guide on Alphonse Daudet's The Last Lesson. Created by the original team behind SparkNotes, LitCharts are the world's best literature guides. A concise biography of Alphonse Daudet plus historical and literary context for The Last Lesson. A quick-reference summary: The Last Lesson on a single page. In-depth summary and analysis of every of The Last Lesson. Visual theme-tracking, too. Explanations, analysis, and visualizations of The Last Lesson's themes. 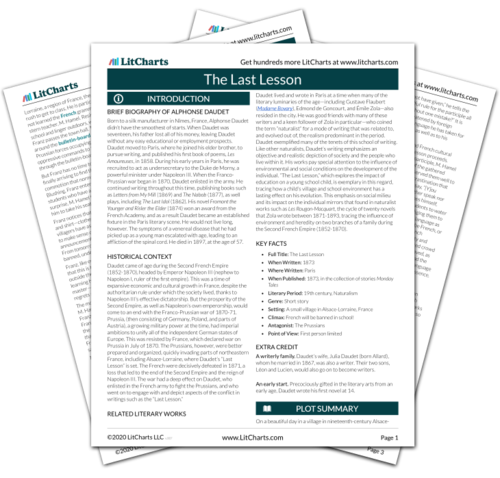 The Last Lesson's important quotes, sortable by theme, character, or . Description, analysis, and timelines for The Last Lesson's characters. Explanations of The Last Lesson's symbols, and tracking of where they appear. An interactive data visualization of The Last Lesson's plot and themes. Born to a silk manufacturer in Nîmes, France, Alphonse Daudet didn’t have the smoothest of starts. When Daudet was seventeen, his father lost all of his money, leaving Daudet without any easy educational or employment prospects. Daudet moved to Paris, where he joined his elder brother, to pursue writing, and published his first book of poems, Les Amoureuses, in 1858. During his early years in Paris, he was recruited to act as undersecretary to the Duke de Morny, a powerful minister under Napoleon III. When the Franco-Prussian war began in 1870, Daudet enlisted in the army. He continued writing throughout this time, publishing books such as Letters from My Mill (1869) and The Nabob (1877), as well plays, including The Last Idol (1862). His novel Fromont the Younger and Risler the Elder (1874) won an award from the French Academy, and as a result Daudet became an established fixture in the Paris literary scene. He would not live long, however. The symptoms of a venereal disease that he had picked up as a young man escalated with age, leading to an affliction of the spinal cord. He died in 1897, at the age of 57. 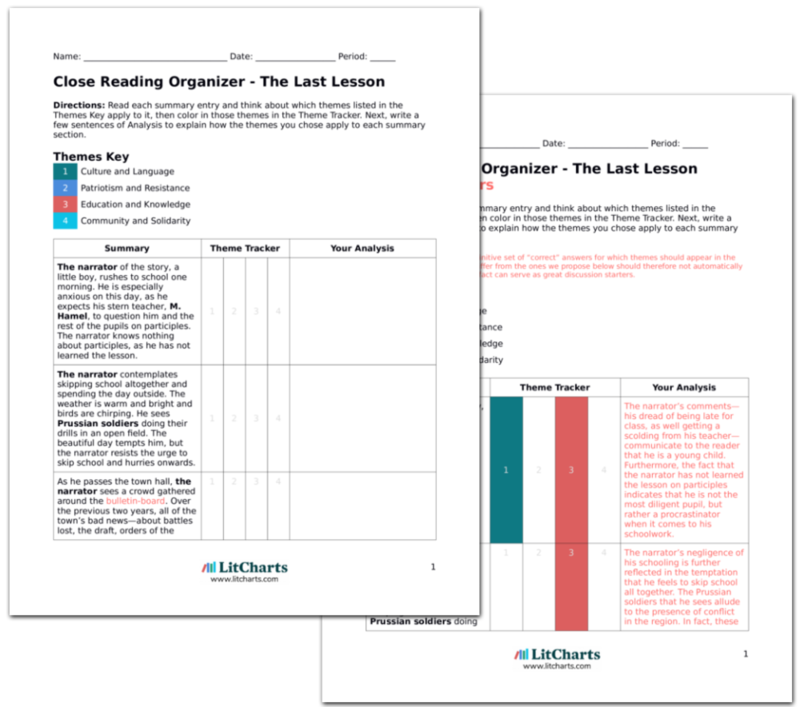 Get the entire The Last Lesson LitChart as a printable PDF. Daudet lived and wrote in Paris at a time when many of the literary luminaries of the age—including Gustave Flaubert (Madame Bovary), Edmond de Goncourt, and Émile Zola—also resided in the city. He was good friends with many of these writers and a keen follower of Zola in particular—who coined the term “naturalist” for a mode of writing that was related to, and evolved out of, the realism predominant in the period. Daudet exemplified many of the tenets of this school of writing. Like other naturalists, Daudet’s writing emphasizes an objective and realistic depiction of society and the people who live within it. His works pay special attention to the influence of environmental and social conditions on the development of the individual. “The Last Lesson,” which explores the impact of education on a young school child, is exemplary in this regard, tracing how a child’s village and school environment has a lasting effect on his evolution. This emphasis on social milieu and its impact on the individual mirrors that found in naturalist works such as Les Rougon-Macquart, the cycle of twenty novels that Zola wrote between 1871-1893, tracing the influence of environment and heredity on two branches of a family during the Second French Empire (1852-1870). Climax: French will be banned in school! A writerly family. Daudet’s wife, Julia Daudet (born Allard), whom he married in 1867, was also a writer. Their two sons, Léon and Lucien, would also go on to become writers. An early start. Precociously gifted in the literary arts from an early age, Daudet wrote his first novel at 14. Abbas, Fatin. "The Last Lesson." LitCharts. LitCharts LLC, 6 Dec 2018. Web. 11 Dec 2018. Abbas, Fatin. "The Last Lesson." LitCharts LLC, December 6, 2018. Retrieved December 11, 2018. https://www.litcharts.com/lit/the-last-lesson.